Wedding Ceremonies, which are, as they should be, the "serious" part of a wedding celebration, are often really boring musically. I haven't had a bride ask for "The Bridal Chorus" (from the 1850 opera "Lohengrin" by Richard Wagner) in years. Brides tend to eschew this choice because it seems OLD. Little do they know that in the original opera, the marriage did not have a happy ending, which is a far better reason for them to choose another song. Many brides stay within the "status quo" and choose a variation of "Canon in D Major" to walk down the aisle. It's a beautiful song, and I love it...no harm, no foul. And...there are a gazillion recordings of this tune. Brides can choose different instrumentations or different interpretations; whatever... nonetheless, their choice is still somewhat "traditional". What about the brides and grooms who unequivocally want non-traditional music? They are not particularly religious and they are not getting married in a church. What are the options musically? Of course, the broad but simple answer is anything, but where do they start? How do they decide? Today's brides and grooms are often trying to find ceremony music that truly represents them and their personalities. One fun alternative that has supplied a plethora of options is a group called "Vitamin String Quartet". You can find them on iTunes. They record string quartet versions of modern music. Think of their repertoire, as the Opus your grandmother never knew existed. Of course, if you want to get really fancy... pick a signature band, just like you pick a signature drink. The choice to have music that was uniquely them and completely NON-TRADITIONAL suited this couple perfectly! They were quirky and fun and walked their own path. It was an amazing choice and an amazing day! Professional Advice: Don't let "old school" musical traditions stifle your wedding day. Embrace the new...take chances....and let your ceremony music be as unique as you and your beloved. The two most important songs in your ceremony are the 'Entrance of Bride' and the 'Recessional'. You will always remember your entrance song and walking down the aisle toward your future lifetime partner. This is a very personal song and chosen carefully. The second important song is the 'Recessional'. This song will set the tone and is the bridge from your wedding ceremony to the FUN at your reception. The Recessional takes place immediately after the bride and groom are pronounced husband and wife and presented to the guests (right after the big kiss!). This is the joyous climax to one of your life's most memorable moments. Typically you will be introduced, your recessional song will fire up, your honored guests will erupt in a wave of applause and hand in hand you will head out into your adoring throng. While most couple's choose a processional song that is traditional, elegant and low-key the recessional is an entirely different situation. Think of this song as a bridge between the religious reverence and quiet tone of the ceremony and the party that is chafing at the bit just waiting to begin. 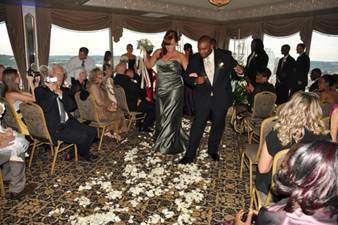 The recessional music is usually an upbeat, celebratory tune, full of joy and happiness. Obviously this selection is typically more jubilant, upbeat and celebratory than other music used during the ceremony. It is now time to rejoice and it's perfectly alright to show this in your choice of music. Will this song be familiar to your guests? Does it reflect our personality as a couple? Will some segment of your crowd consider it offensive ... and do you care? Do you prefer one of the traditional favorites or would you like to make a statement with something more contemporary?